Doug Holloway using our Dry 60 dry carpet cleaning system. We can dry clean your carpets using the our dry cleaning granular system which means you will be able to use your carpets immediately after cleaning. Our system involves several steps and will give you good results but is not suitable for heavily stained carpets or ones where there are odour problems. In these cases we recommend our high powered truck mount cleaning. Our Dry 60 system is very effective on low profile carpets such as office tiles but can also be used with good results on domestic carpeting. We have cleaned many office carpets in Essex and London and our customers have always been pleased with the results. there are no issues with over wetting or smelly carpets . It is probably the best way to clean Sisal natural carpets where results can be limited and shrinkage is a big issue with steam cleaning. Very Fast Drying You can use immediately cleaning is finished. No Shrinkage. No Musty Smells. Nice Fragrance. 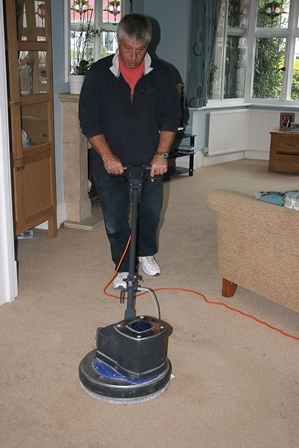 Doug Holloway is a recognised professional within the carpet and upholstery cleaning industry. He has over 30 years experience and is also an Industrial Chemist. He has a wealth of cleaning and stain removal knowledge.